[04/06/2019 @ 06:25 AM] Book this fare on: Priceline, BookingBuddy, Travelocity, SkyScanner, Expedia, Orbitz, Hotwire, CheapTickets. 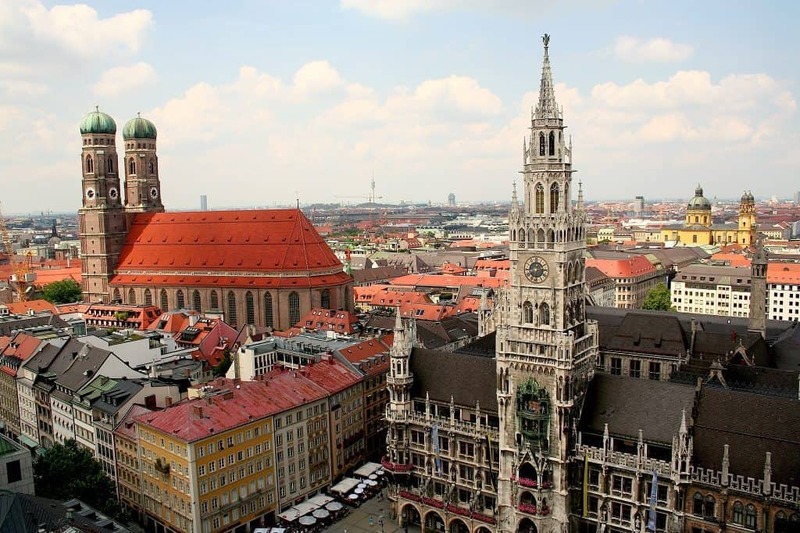 American Airlines and British Airways have round-trip flights from Houston (IAH) to Munich (MUC) for $320-$381 with a connection. October to February. Extended Weekends available. 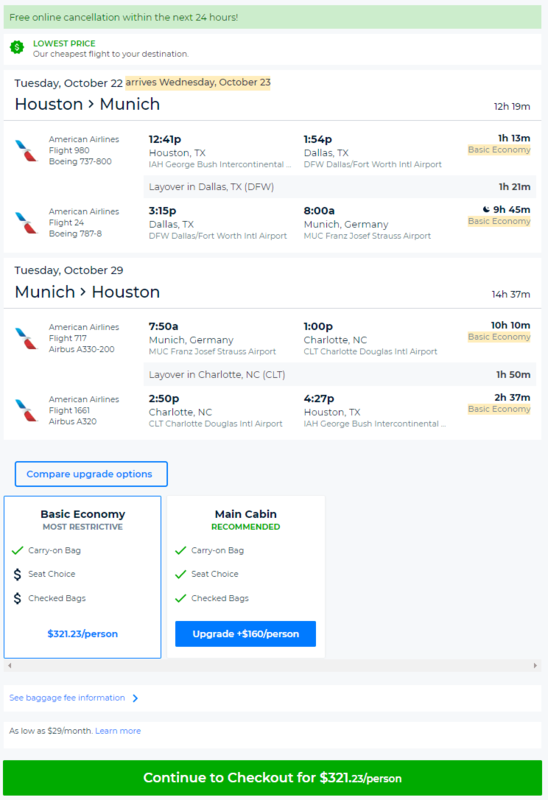 All Example Dates: (BookingBuddy / Priceline) Oct 22 – Oct 29 / Oct 23 – Oct 30 / Oct 24 – Oct 29 / Oct 24 – Oct 31 / Oct 25 – Oct 30 / Oct 28 – Nov 04 / Oct 29 – Nov 03 / Oct 29 – Nov 05 / Oct 30 – Nov 04 / Oct 30 – Nov 06 / Oct 31 – Nov 05 / Oct 31 – Nov 07 / Nov 01 – Nov 06 / Nov 04 – Nov 11 / Nov 05 – Nov 10 / Nov 05 – Nov 12 / Nov 06 – Nov 11 / Nov 06 – Nov 13 / Nov 07 – Nov 12 / Nov 07 – Nov 14 / Nov 08 – Nov 13 / Nov 11 – Nov 18 / Nov 12 – Nov 17 / Nov 12 – Nov 19 / Nov 13 – Nov 18 / Nov 13 – Nov 20 / Nov 14 – Nov 19 / Nov 14 – Nov 21 / Nov 15 – Nov 20 / Nov 18 – Nov 25 / Nov 19 – Nov 24 / Nov 19 – Nov 26 / Nov 20 – Nov 25 / Nov 20 – Nov 27 / Nov 21 – Nov 26 / Nov 21 – Nov 28 / Nov 22 – Nov 27 / Nov 25 – Dec 02 / Nov 26 – Dec 01 / Nov 26 – Dec 03 / Nov 27 – Dec 02 / Nov 27 – Dec 04 / Nov 28 – Dec 03 / Nov 28 – Dec 05 / Nov 29 – Dec 04 / Dec 02 – Dec 09 / Dec 03 – Dec 08 / Dec 03 – Dec 10 / Dec 04 – Dec 09 / Dec 04 – Dec 11 / Dec 05 – Dec 10 / Dec 05 – Dec 12 / Dec 06 – Dec 11 / Dec 09 – Dec 16 / Dec 11 – Dec 16 / Jan 02 – Jan 09 / Jan 08 – Jan 13 / Jan 08 – Jan 15 / Jan 09 – Jan 14 / Jan 09 – Jan 16 / Jan 10 – Jan 15 / Jan 13 – Jan 20 / Jan 14 – Jan 19 / Jan 14 – Jan 21 / Jan 15 – Jan 20 / Jan 15 – Jan 22 / Jan 16 – Jan 21 / Jan 16 – Jan 23 / Jan 17 – Jan 22 / Jan 20 – Jan 27 / Jan 21 – Jan 26 / Jan 21 – Jan 28 / Jan 22 – Jan 27 / Jan 22 – Jan 29 / Jan 23 – Jan 28 / Jan 23 – Jan 30 / Jan 24 – Jan 29 / Jan 27 – Feb 03 / Jan 28 – Feb 02 / Jan 28 – Feb 04 / Jan 29 – Feb 03 / Jan 29 – Feb 05 / Jan 30 – Feb 04 / Jan 30 – Feb 06 / Jan 31 – Feb 05 / Feb 03 – Feb 10 / Feb 04 – Feb 09 / Feb 04 – Feb 11 / Feb 05 – Feb 10 / Feb 05 – Feb 12 / Feb 06 – Feb 11 / Feb 06 – Feb 13 / Feb 07 – Feb 12 / Feb 10 – Feb 17 / Feb 11 – Feb 16 / Feb 11 – Feb 18 / Feb 12 – Feb 17 / Other dates: There are more dates available than the ones we list here, experiment on your own. Extended Weekend Example Dates: (BookingBuddy / Priceline) Oct 24 – Oct 29 / Oct 25 – Oct 30 / Oct 31 – Nov 05 / Nov 01 – Nov 06 / Nov 07 – Nov 12 / Nov 08 – Nov 13 / Nov 14 – Nov 19 / Nov 15 – Nov 20 / Nov 21 – Nov 26 / Nov 22 – Nov 27 / Nov 28 – Dec 03 / Nov 29 – Dec 04 / Dec 05 – Dec 10 / Dec 06 – Dec 11 / Jan 09 – Jan 14 / Jan 10 – Jan 15 / Jan 16 – Jan 21 / Jan 17 – Jan 22 / Jan 23 – Jan 28 / Jan 24 – Jan 29 / Jan 30 – Feb 04 / Jan 31 – Feb 05 / Feb 06 – Feb 11 / Feb 07 – Feb 12 / Other dates: There are more dates available than the ones we list here, experiment on your own. TUE/WED Example Dates: (BookingBuddy / Priceline) Oct 22 – Oct 29 / Oct 23 – Oct 30 / Oct 29 – Nov 05 / Oct 30 – Nov 06 / Nov 05 – Nov 12 / Nov 06 – Nov 13 / Nov 12 – Nov 19 / Nov 13 – Nov 20 / Nov 19 – Nov 26 / Nov 20 – Nov 27 / Nov 26 – Dec 03 / Nov 27 – Dec 04 / Dec 03 – Dec 10 / Dec 04 – Dec 11 / Jan 08 – Jan 15 / Jan 14 – Jan 21 / Jan 15 – Jan 22 / Jan 21 – Jan 28 / Jan 22 – Jan 29 / Jan 28 – Feb 04 / Jan 29 – Feb 05 / Feb 04 – Feb 11 / Feb 05 – Feb 12 / Feb 11 – Feb 18 / Other dates: There are more dates available than the ones we list here, experiment on your own. 1-Week Example Dates: (BookingBuddy / Priceline) Oct 22 – Oct 29 / Oct 23 – Oct 30 / Oct 24 – Oct 31 / Oct 28 – Nov 04 / Oct 29 – Nov 05 / Oct 30 – Nov 06 / Oct 31 – Nov 07 / Nov 04 – Nov 11 / Nov 05 – Nov 12 / Nov 06 – Nov 13 / Nov 07 – Nov 14 / Nov 11 – Nov 18 / Nov 12 – Nov 19 / Nov 13 – Nov 20 / Nov 14 – Nov 21 / Nov 18 – Nov 25 / Nov 19 – Nov 26 / Nov 20 – Nov 27 / Nov 21 – Nov 28 / Nov 25 – Dec 02 / Nov 26 – Dec 03 / Nov 27 – Dec 04 / Nov 28 – Dec 05 / Dec 02 – Dec 09 / Dec 03 – Dec 10 / Dec 04 – Dec 11 / Dec 05 – Dec 12 / Dec 09 – Dec 16 / Jan 02 – Jan 09 / Jan 08 – Jan 15 / Jan 09 – Jan 16 / Jan 13 – Jan 20 / Jan 14 – Jan 21 / Jan 15 – Jan 22 / Jan 16 – Jan 23 / Jan 20 – Jan 27 / Jan 21 – Jan 28 / Jan 22 – Jan 29 / Jan 23 – Jan 30 / Jan 27 – Feb 03 / Jan 28 – Feb 04 / Jan 29 – Feb 05 / Jan 30 – Feb 06 / Feb 03 – Feb 10 / Feb 04 – Feb 11 / Feb 05 – Feb 12 / Feb 06 – Feb 13 / Feb 10 – Feb 17 / Feb 11 – Feb 18 / Other dates: There are more dates available than the ones we list here, experiment on your own.